(Dallas, Texas) – Toptracer – the world’s leading ball-tracking technology, which is revolutionizing how fans watch and play golf – is the Presenting Sponsor of the 2019 PGA Merchandise Show’s Demo Day, where it will debut a new mobile-based handheld solution that allows uncovered driving ranges to capitalize on the revenue-generating benefits of Toptracer Range. Award winning broadcaster takes show worldwide beginning November 7 at 8:00 a.m. EST. Orlando, FL— After over a decade on SiriusXM Radio, Matt Adams, the award-winning broadcaster, writer, New York Times best-selling author and Golf Channel commentator, is taking his nationally acclaimed golf radio show, Fairways of Life global. Adams and Fairways of Life announced today that the largest independent digital show in golf talk radio history will be available for free across the U.S. and worldwide beginning this week on November 7 at 8:00 a.m. EST. Adams, who has been the host of the program since its inception in 2007, remains as enthusiastic as ever. "We are so excited to be able to provide in-depth golf radio content to all of the USA and around the world on air, on line and on demand for free," Adams said. "It makes it so simple now to find the Fairways of Life Show on whatever device consumers use to listen, whether it be live or on demand, through every major digital audio platform." Fairways of Life with Matt Adams will be live Monday – Friday at 8:00 a.m. EST on FairwaysofLife.com and the Fairways of Life App (available in both iOS and Android). Click on the links below to download the App. In addition, Fairways of Life with Matt Adams can be heard on iHeart Radio (90 million), TuneIn Radio (60 million) and on demand worldwide 24/7 on every major audio digital platform reaching billions of consumers including; iTunes (800 million), Spotify (170 million), Stitcher, Google Play (1 billion), Twitter (330 million) and Facebook (1.86 billion) as well as, Spreaker and Amazon Alexa. Fairways of Life's unprecedented worldwide distribution will instantly cause the show to become the most widely distributed daily live golf talk show in the world. The Fairways of Life Show, the most listened to golf in the world, is an entertaining and fun platform for inside information, unforgettable interviews with the game's legends and stars, as well as lively interactive discussions about the game, travel and the latest in golf equipment. Matt Adams' passion for the game and for life creates a show that's unlike any other and will keep you informed, entertained and engaged. Matt Adams, a Golf Channel personality, multiple-time New York Times best-selling author, and host of Fairways of Life with Matt Adams, has become one of the golf industry's top voices, broadcaster and expert in golf business, equipment, and history. For over 30-years, Adams has worked in golf club operations, golf equipment and golf media. He is an expert in golf equipment technology spending years in the OEM side of the game, having designed and/or built golf clubs for the biggest names in the industry, including Nicklaus, MacGregor, Ram and Wilson. Adams has been called "the best interviewer in golf" by golfing legends including Billy Casper and Gary Player. Adams broadcasting talents have been featured on the SiriusXM PGA TOUR Radio, BBC, ESPN, Golf Channel, PGA Tour Entertainment, European Tour Productions and DirecTV, among others. He has hosted broadcasts from every Major Championship and multiple Ryder Cups. BOURBON, MO – Imperial Headwear, the #1 headwear brand for Private and Resort golf facilities as reported by the Association of Golf Merchandisers (AGM) in their Member Survey, the last 3 consecutive years, announced a "Giving Back" e-commerce fundraising collaboration with Youth on Course (YOC). 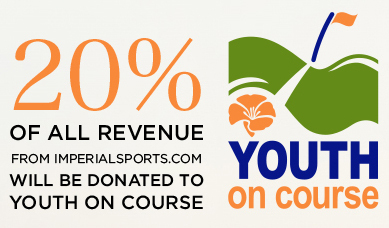 On Tuesday, November 28th, Imperial will donate 20% of all online revenue at ImperialSports.com to YOC. The proceeds going to YOC will help its members maintain the ability to enjoy golf for $5 or less and will provide access to important programs. "YOC is very appreciative of this Giving Tuesday collaboration with Imperial Headwear," says Youth on Course Executive Director, Adam Heieck. "It's great that Imperial is giving back and we are proud to work with them to help provide youth with access to affordable golf." #GivingTuesday, Nov. 28th, is a global day of giving fueled by the power of social media and collaboration. 2017 marks the sixth year of Giving Tuesday with over $177 million raised online alone. "I am very excited to collaborate with YOC to help provide for their foundation and its members. Our values align with YOC's mission of growing the game and access for youth golfers" said David Shaffer, vice president sales & marketing at Imperial Headwear. "Imperial looks forward to doing our part on Giving Tuesday, and giving back to foundations we believe in." For more information about Imperial Headwear please visit ImperialSports.com, contact your local sales representative or call (800) 950-1916. For more information and a list of Youth on Course partners, please visit youthoncourse.org, or call 831.625.4653. Founded in 1916, Imperial Headwear is the leading manufacturer and marketer of premium quality headwear for the golf market. Imperial is committed to style, functionality and perfection in fit and comfort. It is this commitment that has allowed the creation of a wide variety of headwear with quality that is second to none. Renowned for its superior customer service and art customization capabilities, Imperial offers its products using the most innovative fabrics and designs, as well as logo and embroidery technologies. For further information please visit imperialsports.com or call (800) 950-1916. Follow Imperial Headwear on Twitter and Instagram at @ImperialHats and on Facebook at facebook.com/ImperialInc. Imperial Headwear's 100th Anniversary video can be viewed at https://vimeo.com/131945482. Born in 2006 out of the Northern California Golf Association, Youth on Course began as the NCGA Foundation - a way to increase the accessibility and affordability of golf for Northern California youth. Within five years, the program was thriving and we expanded opportunities for our members to include caddie programs, paid high school internships and college scholarships. It quickly became apparent that there was a huge demand for what we were doing outside of Northern California. The NCGA Foundation was re-imagined as a nationwide initiative to grow the game, and the name Youth on Course was born to establish a national identity.To date, we have expanded Youth on Course to 19 regions, subsidized more than 500,000 rounds of golf, hired more than 115 interns and 362 caddies, and award $275,000+ in scholarships annually.